Summer is a great time of year that is often filled with families and friends taking vacations. Unfortunately, when summer is over many people face the reality that they charged their vacation on their credit card. Why? Because they didn’t save in advance! Next year can be different. 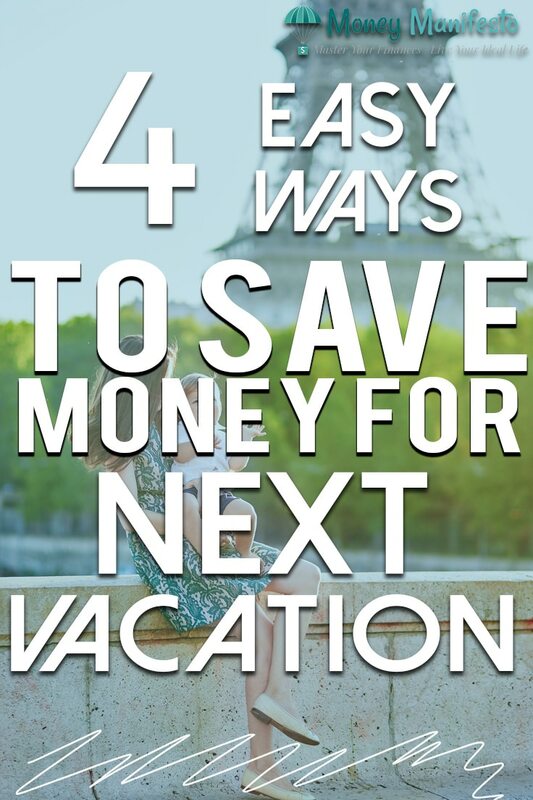 If you start following these easy tips to save for your next vacation, you should easily be able to have enough money for a nice family vacation next summer. This easy vacation saving tip is for people who still use cash on a regular basis. There are two great ways to save using this strategy depending on how much you need for your upcoming vacation. The first method is the change jar. Whenever you get change from breaking a bill, put the change in a jar until your vacation. For most people, this likely won’t be enough to pay for a whole vacation, but the second variation, the small bills jar, might. The small bills jar is the same concept as a change jar except instead of putting just change in the jar, you put any small bills in the jar as well. What you define as a small bill is completely up to you as well as how much you’ll need for your vacation. You can opt for just $1’s, $5’s, $10’s, $20’s or any combination of bills you want. This is a strategy I always used to save money when I was a kid, but it works for adults, too. Whenever I’d come across any unexpected money I’d put it straight in my savings account. These days I don’t get the same types of miscellaneous income I received as a kid (birthday cards, Christmas cards, etc) but I do end up with other random amounts of money. Whenever you get a rebate check, a bonus from work, you find money on the ground, you get your tax refund or any other random income you come across, put it in a separate bank account for your next vacation. Related: How To Take A 7 Day Cruise For Free! This is the most reliable and responsible way to save for your next vacation and it is one of the ways we personally save for our vacations. Every paycheck we put a set amount of money into a targeted savings account at our bank. If you have a set amount you want to spend on your vacations each year, divide that by the number of paychecks in a year to get your per paycheck amount to save. If you’ve already budgeted for your next vacation and it is less than a year away, take the amount you have budgeted for your next vacation and divide it by the number of paychecks until your next vacation to figure out how much to save each paycheck. Just remember to plan to have a little extra money in case things don’t go according to plan. Credit card rewards are one of my favorite ways to save for vacation. I routinely look for the best sign up bonus credit cards to earn large chunks of money toward my next vacation. Sometimes I find a great deal on an airline credit card and other times I just find a great general cash back offer that will allow me to put money toward my next vacation. If you’re interested, click here to see the best bonus cards out there today. I update the list every month so you know you’ll be getting the best deals. Be careful though, some of the vacation type credit cards such as the Carnival Cruise credit card and Disney credit cards don’t really offer the best value. I’d recommend going for a more generic credit card that isn’t associated with any given vacation brand in most cases. They generally will give you more rewards per dollar spent. Saving for vacation isn’t a difficult concept. You just have to be dedicated to saving the money before you leave for your trip. The four saving methods above should give you plenty of ideas of ways to save for your next vacation so you don’t end up paying off the credit cards months after you get back. How do you save for your vacations? Do you follow one of the methods above, or do you save in a different way? I’m saving points and by September will have enough for a ticket to Thailand, then 6 days in Bangkok then a few days in Kuala Lumpur. Using credit cards for points offers amazing value. Good Post. That’s amazing! I hope you enjoy your trip! These are all great tips! We are planning to have a vacation twice a year and I think we should start saving for our future vacation. Yup, you should definitely save for them in advance! My partner and I started a vacation fund when we found out that my cousin was getting married in Mexico. We just put all of our change and $5 bills in a jar, and we ended up with well over $600 by the end of the year between the two of us. Not enough to go to Mexico, but it certainly put a dent in it. Hey $600 is awesome. My jar would have next to nothing in it because I rarely ever use cash… but that might just be me. These are great tips! At our old jobs, we always got significant Christmas bonuses. We always used them for our next year’s vacation fund! I love vacation rewards! With my Delta Skymiles card, not only do I build miles on purchases, I also get an extra 10,000 miles if our household spending on card exceeds $25,000 each year which is easy with a wedding coming up. I also get a free companion voucher on renewal. So for a recent trip to Cincinnati for a wedding, which is one of the most expensive airports to fly into despite close proximity, we ended up using the companion ticket since that was a better deal than using miles. Travel rewards are the best! I use frequent flier miles to travel overseas. The payoff is huge! I believe in making vacation goals automatic. I use a payroll deduction to save for many annual expenses. I definitely want to get in on this awesomess of credit card rewards. I have a lot of miles built up from traveling back and forth to Grenada so much. I’m ready to use them! Miles are amazing! I got $1000 last year alone!